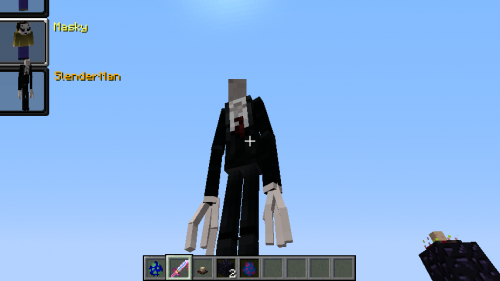 This mod allows the player to transform into any mob killed them. You can switch between different forms at any point in the game. Just an incredible dress! In addition, the mod works with all living creatures other add-ons, including the boss! The transformation process is unique: each piece of model mob separated fragments and replaces the player model! The mod is still in the beta stage of development, so that in the future there will be many new features! The opportunity to get in shape virtually any mob, killing him. This includes the other players, silverfish, turret (of mod PortalGun) and even descriptive of the book (of mod Mystcraft). Overview of forms stored by pressing HOME / END. The keys can be replaced in the configuration file. Opening the window, you can scroll through the form with the mouse. The choice of form by pressing ENTER / RETURN / LMC. The transformation process takes 4 seconds. At this time you can not get new forms. Ability to delete a shape by pressing DELETE / BACKSPACE (can be customized). You can not delete their original shape and the one you are currently using. Closure of the overview window by pressing the ESCAPE / PCM. The window also closes automatically when you open another interface element.